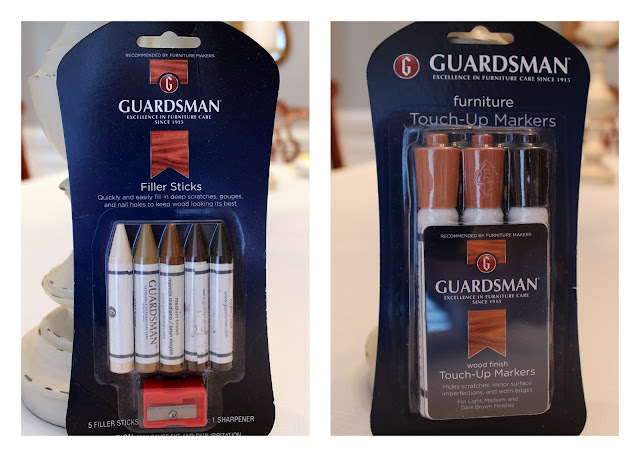 Many years ago when we purchased furniture for our Master Bedroom and Dining Room, Guardsman Furniture Care products were recommended by the stores where we purchased our furniture. 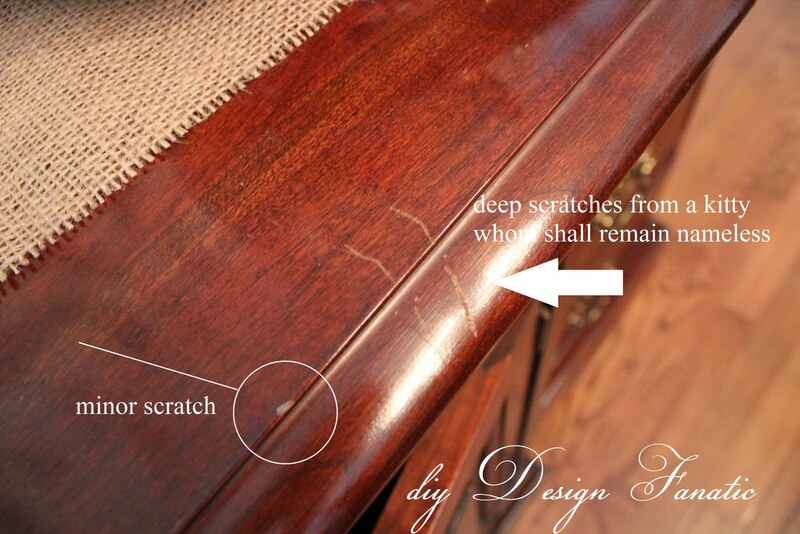 I've used Guardsman wood polish cream quite often since then and my wood furniture still looks great! Guardsman sent me out a few products to try and to review for you. These are my opinions and they did not influence me in any way and I was not paid by them, other than the products they sent me. The products I really wanted to try were the Filler Sticks and Touch-Up Markers. I remember seeing these scratches on the top of our Dining Room Buffet after hearing two of our cats chasing each other around the house, and yes, on the good furniture. Following the directions on the back of the package, I used the darkest filler stick and rubbed it into the scratches. Then, I used a microfiber cloth to remove the extra material. Next, I used the dark marker on the smaller mark to the left of the scratches. It blended in perfectly. I then used the marker on the newly filled in scratches. The other product wanted to try was the Fabric Protector. I had the PERFECT thing to try it on. Remember our Front Porch Makeover? The iron bench is the favorite evening napping spot for my cat Buddy, so the cushion definitely needed protecting. Now my new cushion is protected against spills and stains....Wish it repelled cat fur! To celebrate Guardsman's Stop Cleaning and Start Caring (for your furniture) promotion, Guardsman is offering everyone the chance to win a personal design session at home, complete with $1,500 room re-accessorizing and shopping experience with TV Design Star Tracy Hutson (Extreme Home Makeover). To win, log onto Guardsman.com and share a story about your favorite piece of furniture and make a promise to care for it the same way you care for other things you love. I need to follow your directions for taking out scratches. Thanks for visiting my blog and leaving your sweet comment. I'm going to look for those filler sticks, I have a small nick in my great room console that bugs me every time I look at it.